As many London Calling readers know, I am a big believer in the power of social serendipity. My “one tweet that got me to IBM” story is something I often repeat to IBM Clients as well as audiences around the world. Today while waiting to board my British Airways flight to New York from Heathrow, I noticed a tweet from JP Rangaswami, Chief Data Officer at Deutsche Bank (@Jobsworth) showing him stuck in the traffic on the approach to Heathrow Terminal 5. Having experienced exactly the same view only moments before, I opined that perhaps he was also travelling with British Airways from Terminal 5. 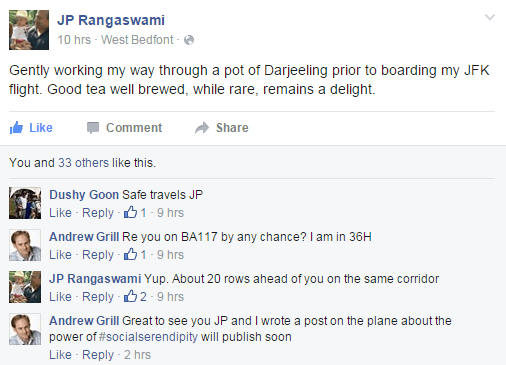 Checking my Facebook feed (JP and I are friends on Facebook, and I have known him for a number of years, from when he was Chief Scientist at BT), JP had mentioned he was sipping tea before his flight to JFK. What are the chances that he would be on the same fight, BA 117 to JFK? Settling in on board the flight, I now realised JP was indeed on the flight, so I messaged him on Facebook including my seat number. We pushed back, and I lost data connectivity so had no idea if JP had received my message and seat number. I did however receive a tweet from Connor Ogle (@cmogle) saying he was also on the flight. Imagine my surprise when a few hours into the flight, who should breeze through the dividing curtain than JP himself! He said he had cleared it with the cabin crew that we could stand near one of the emergency exits and catch up. While JP and I were talking, another of his colleagues, Nick Doddy (Chief Innovation Officer for Deutsche Bank) stopped by and the 3 of us had an interesting chat. JP is such am amazing storyteller and he was recounting to Nick and I about how he used the power of serendipity when he was working for a well-known consulting firm and he was trying to get the attention of one of the UK’s largest banks. I will let JP tell his own story (if you haven’t met him yet then you need to) but it is all about being in the right place at the right time. Social allows you to do just this as my post has shown. Will you let #socialserendipity put you in the right place at the right time?